In stock 10 . Also available in our walk-in store. 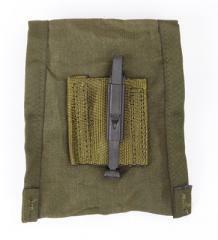 A small nylon pouch for a compass or first aid dressing. A really handy addition to any rucksack and shoulder bag, or just hang it on your belt. 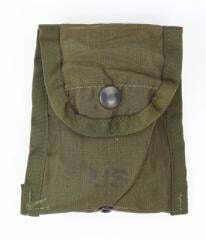 The M-1956 first aid / compass pouch was more or less directly transferred over to the newer systems. The first improvement came in 1967 in the guise of a pouch of the same model, but made of nylon and with a plastic snap fastener, instead of the older canvas one which had a standard metal snap. Canvas and metal items don't play well in the moist jungle. Later, in the 70's, these were redesigned slightly and the plastic snap - which ultimately proved too fiddly - was changed to a brass one. 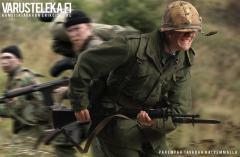 This is pretty much how things stayed up until the advent of MOLLE gear. This is a simple, envelope-like square pouch with one US keeper on the back and a metal snap in the front. In used but perfectly serviceable condition. Genuine stuff made in the US and A.